At Eco Insulation we use cellulose insulation. 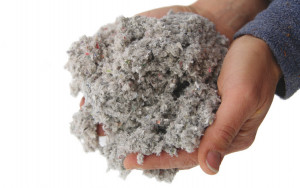 The main reason we prefer blown fiber cellulose is because of its extremely high content of recycled material. Its made up of 85% recycled news paper that has been treated with boric acid and borate which makes cellulose flame resistant, pest resistant and mould resistant. Boric acid is a very weak acid, used as an antiseptic and insecticide and in the production of insulation materials. When installed, cellulose creates a monolithic blanket in your attic. It has the ability to fill gaps, nooks and cranny’s. Cellulose is denser than fiberglass. When insulating your attic it’s important to keep that in mind. Fiberglass requires 18″ of product to achieve an R50. Cellulose achieves this in 13.5″ . This is really relevant when the perimeter of your attic has limited amount of space to add insulation. Older homes often times have a low roof pitch which restricts the amount of insulation that can be installed around the perimeter above the soffits. So at the eves you may only be able to achieve an R20 or lower. Yet another reason why use cellulose insulation. The video below displays the awesome power of cellulose in some field experiments, 3 structures are side by side, one is not insulated, the other is insulated with fiberglass insulation and the third with cellulose insulation. the non insulated and insulated fail at almost the exact same time while the cellulose house has a 25minute gap. 25 minutes in a house fire is life or death. Check out this video and see for your self why use cellulose insulation. Mould resistant, pest resistant, flame resistant cellulose insulation in a great choice when insulating your attic in a new home or existing attic top up. The Big Burn Video showcases why use cellulose insulation.